Her T-shirt was drenched in sweat as she trudged through the woods, ferns lapping at her legs. The cool breeze that greeted her atop the mountain seemed a distant memory in the dense forest, where the afternoon heat sat still. Her T-shirt was drenched in sweat as she trudged through the woods, ferns lapping at her legs. The cool breeze that greeted her atop the mountain seemed a distant memory in the dense forest, where the afternoon heat sat still. As she neared the end of the hike, all she could think about was dipping her tired body in the cold mountain water of Nesowadnehunk Stream. There, at a series of natural water slides, she would ease into the frothing water, raise her arms in the air and let the current carry her away. Over hills of slippery, smooth granite, she’d slide downstream to be dumped into a pool, where the current would calm and she could gently float on her back, her hair fanning out around her head in the water. Goosebumps would rise up on her arms and legs. The stream, frigid even at the height of summer, would refresh her in a matter of minutes. But it wouldn’t be until her fingers started to tingle that she’d tread to shore, crawl out of the water and sit on a sunbaked ledge. In August, a swim is the perfect ending to a great hike. Rising 3,488 feet above sea level in Baxter State Park, Doubletop Mountain has a distinct profile, a nearly symmetrical cone shape with steep slopes and two distinct peaks. While much of the mountain is forested, the trees disappear at both peaks, revealing stunning views of the park. To the east and southeast, mountains break up the horizon — North and South Brother, Mount Coe, Mount OJI and, of course, Katahdin. To the west, you’re looking outside the park at a flatter landscape broken up by water — Harrington Lake and the connected Ripogenus, Chesuncook and Caribou lakes. Hiking the mountain, depending on the route you take, is between 6.6 and 7.6 miles total. Nearby, Ledge Falls, also known as “The Ledges,” is a popular swimming spot on Nesowadnehunk Stream, where the water has worn the rock into several smooth natural water slides. While being swept downstream by the current, swimmers can enjoy an amazing view of Doubletop Mountain. When through with swimming, the flat rock along the stream’s edge is a perfect spot for sunbathing and picnicking. 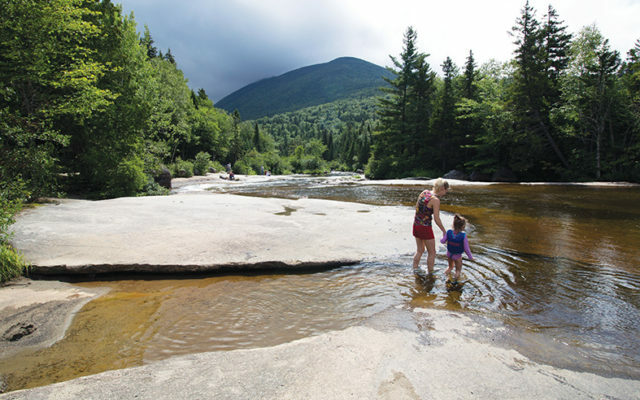 Visiting Baxter State Park is free for Maine residents, but camping is permitted by reservation only May 15-Oct. 15, and Dec. 1-March 31. For nonresidents, it costs $14 per vehicle in the summer. Dogs are not permitted. For more information about fees and park rules, visit baxterstateparkauthority.com or call 207-723-5140. Directions: Start at the Togue Pond Gate, the south entrance of Baxter State Park. Veer left on the Park Tote Road after checking in at the gate, and drive along the narrow, winding gravel road for about 17 miles to Nesowadnehunk Campground. The speed limit is 20 mph. After the road crosses a bridge over Little Nesowadnehunk Stream, you will come to an intersection by a field. Turn left and park in the day-use parking area on your right. Signs will direct you to cross a bridge over Nesowadnehunk Stream to reach the north trailhead to Doubletop Mountain Trail. After hiking to both peaks, turn around and hike back down the way you came. Don’t continue on the trail, or you’ll end up at the south trailhead without a car. To reach The Ledges after your hike, drive back toward the park’s south entrance on the Park Tote Road about 2 miles, and you’ll see The Ledges on your right. There are a few parking areas, but people also park alongside the road, where there’s room to be out of the way of traffic. The cliffs on Beech Mountain feature fun, moderately challenging trails that require a little hand-over-foot climbing. Just below this hike lies Echo Lake. With crystal clear waters, a sandy bottom and plenty of shallow areas that warm up in the sun, it’s no wonder Echo Lake is one of the most popular swimming destinations in Acadia National Park. The half-mile Beech Cliffs Trail starts at Echo Lake Beach and steeply switchbacks up the mountain. This trail includes ladders, rungs and beautiful stone steps. Like many mountain trails, this trail becomes increasingly steep as it approaches the top of the cliffs, where you’ll find the 0.4-mile Beech Cliffs Loop. The loop explores the top of the cliffs, offering great views of the island, including the lake below. After completing the small loop, I suggest descending the mountain on the 1-mile Canada Cliffs Trail, because it’s more gradual and not as dangerous to descend as the Beech Cliffs Trail. The Canada Cliffs Trail will lead to the Echo Beach parking lot, where you can take a short path to Echo Beach for a swim. All visitors to Acadia National Park must pay an entrance fee upon entry May through October. A private vehicle is $30 for 7 days, and an annual pass is $55. Dog are permitted but must be on a leash no longer than 6 feet at all times. Directions: Drive onto Mount Desert Island from the mainland on Route 3. The road splits at the end of the causeway. Veer right onto Route 102-Route 198, heading south, and drive 8.6 miles, passing through Town Hill and Somesville on the way. Before reaching the town of Southwest Harbor, turn right onto Echo Lake Beach Road. Drive 0.3 to the parking lot at the end of the road. The trails start right at the parking lot. Located on French’s Point, where the Penobscot River enters the Penobscot Bay, Sandy Point Beach Park features a beautiful beach of sand and rocks, as well as network of about 2 miles of trails that wind through a lovely forest to a more private spot on the shore. This place is rich in history. Artifacts found along the shoreline indicate it once was a summering and trading spot for Native Americans. During the American Revolution, a major naval battle took place in nearby waters, where 39 American vessels were lost. For a long time, this site was bustling with industry. Today, the park is a favorite among families, dog owners and wildlife enthusiasts. Osprey and cormorants nest on the pilings that remain from an old wharf, and a wide variety of birds can be found in the grasses and bushes along the shore. Directions: In Stockton Springs, turn off Route 1 onto Steamboat Wharf Road and drive 0.5 mile to the parking lot at the end of the road. On Google Maps, this road is unnamed and lies just south of Sandy Point Road and north of Pirates Cove Road. The trail network starts with a wide gravel path at the south end of the parking lot. A wooden boardwalk that leads to the beach starts on the east side of the parking lot.